Near Earth Objects are asteroids or comets that have orbits around the Sun that bring them close to the Earth. The actual definition of an NEO is a comet or asteroid whose orbit brings it close to Earth’s orbit. The criterion is a perihelion distance < 1.3 AU. 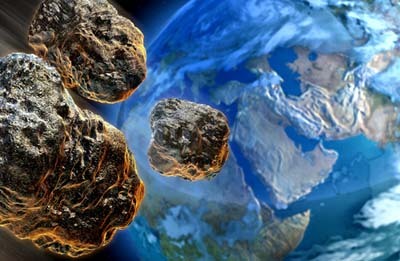 The Earth is hit by an enormous amount of material every day – mostly dust and small objects that end up as meteorites. However, every now and again something large enough to do some real damage comes along. The smaller objects will be slowed down by the atmosphere, and will burn up or break up high above the ground. 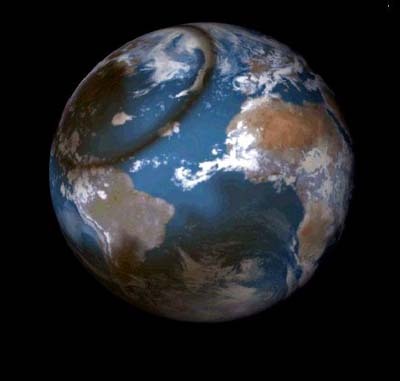 However, if an object is big enough, heavy enough and travelling fast enough the atmosphere doesn’t have time to slow it down, and it will hit the ground at about the same speed as it was travelling through space (relative to the Earth). For asteroids this speed is typically somewhere between 12 and 20 km per second; comets are much faster. You would need a stony asteroid larger than about 150 metres in diameter (about 50 metres for an iron) to hit the ground fast enough.When something like that hits the ground it doesn’t stop – it keeps on going until the ground physically stops it. On the way through the ground our meteorite gets enormously hot – it’s being compressed, as is the ground in front of it, friction kicks in and so on. In fact the whole thing gets so hot that, under normal circumstances, metal and rock would vaporise. But it can’t do that because the pressure holds the whole thing together, until it stops. Then there is no pressure and the meteorite and the rock around it explosively vaporise. We get a huge underground explosion. This blows a big hole (crater), and the process explains why meteorite craters are circular. In the old days people assumed that, if an object hit the ground at an angle it would make an oval shaped hole. In fact, of course, it doesn’t matter what angle the object hits at. It keeps going, and, when it stops underground, it explodes forming a round hole. Immediate effects will include the obvious explosive effects at ground zero and local firestorms raised by the superheated air from the impact. 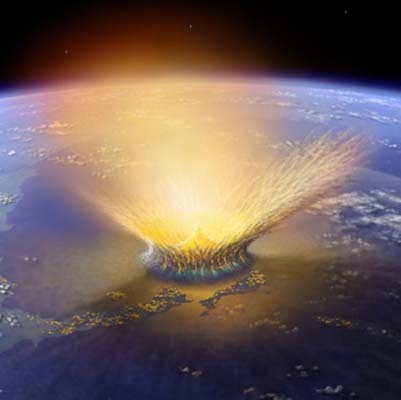 A crater, about 20 times the diameter of the impacting body, will be excavated in a matter of seconds, and debris will be ejected into sub orbital trajectories. This debris will later re-enter the atmosphere – the meteor shower from hell – possibly all over the globe raising massive fires that destroy a significant proportion of the biomass. Intense acid rain would result from the ionisation of the air as the impactor entered the atmosphere, as would the production of pyrotoxins. The ozone layer would be severely damaged, and major volcanism and seismic activity can be expected as the shock wave of the impact ripples through the planet. All of this will cause a global environmental disaster of extreme severity. In addition to most or all of these effects, an impact at sea will produce a significant “tsunami,” capable of travelling considerable distances, and possessing enormous energy. Such surges will pose a substantial threat to low lying and coastal areas. The United Kingdom, with much of its population and economic infrastructure located in precisely such areas, would be at particular risk from an impact anywhere in the Atlantic Ocean. However, the main killing mechanism will be the vast amount of dust and debris injected into the upper atmosphere, combined with the smoke from the firestorms (witness recent events in Indonesia). These will obscure the Sun and cause a phenomenon similar to, but much more severe than the “nuclear winter” that became such an issue during the Cold War. It is this that is likely to pose the greatest threat to the ecosphere on a global scale as food chains collapse and darkness, cold and starvation set in. After a few months or years the atmosphere will clear, but the surface of the Earth, now mainly white in colour, might reflect too much of the Sun’s radiation to prevent a new ice age. However, there are other mechanisms at work. The atmosphere will contain a substantial excess of CO2, resulting from the global fires, the release of the gas from carbonate rocks and volcanism. The Earth could be in for a massive overdose of greenhouse effect. The balance between sweltering and freezing is a very fine one. Such globally threatening events can be expected on time scales of 100,000 years. Smaller strikes, in the 50-100 metre range, though not globally threatening, have in the past caused massive damage to the area of impact, and often at considerable distance. We saw this at Tunguska in 1908 and in the Amazonian Rain Forest in 1930. The spread of human settlement, civilisation, and particularly urbanisation, makes it much more likely that a future impact, even relatively small, could result in the massive loss of human life and property. The time scale for such impacts is between 50 and 100 years. Even much smaller impacts can have significant effects. Typically a 10-metre diameter body will have the kinetic energy of about 100 kilotons (Hiroshima was about 15 kilotons), and is likely to detonate at an altitude above 10 km, causing little or no damage on the ground, but considerable alarm to those who witness it as was seen on 9 October 1997 in El Paso, Texas. 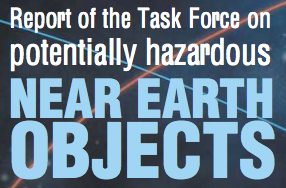 Such events have been recorded by US surveillance satellites at the rate of one or two per month, and smaller Kiloton sized explosions happen every 1 to 10 days.